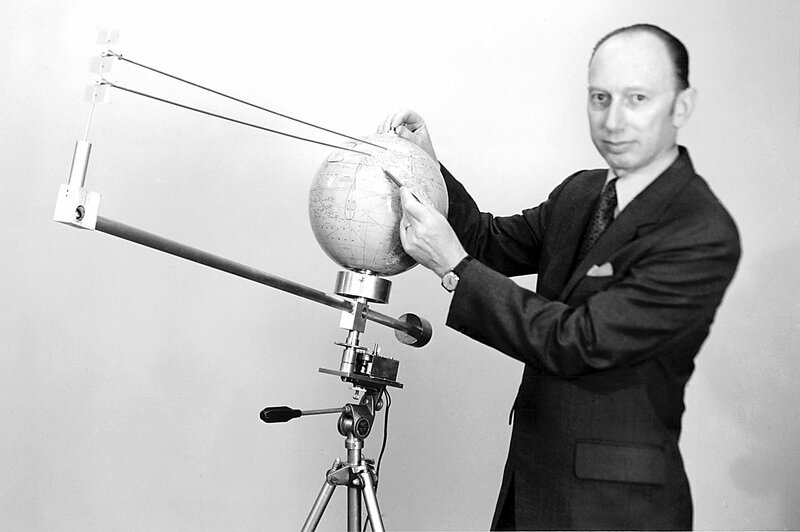 Father of solar power satellite idea, Peter Glaser. Sally Ride – America’s First Woman in Space by Lynn Sherr; Simon & Schuster, New York, New York; $28.00; June 2014. This is a truly inspiring book, written by a top-notch journalist about an extraordinary woman – Dr. Sally Ride. It’s corny to talk of Ride as a woman who simply served up the proverbial “right stuff” in tennis player fashion – but more a person who shattered NASA’s “celestial glass ceiling.” This book is a wonderful portrait of Ride – a self-described introvert – but a woman that inspired so many others to strive for and cultivate a “can do” spirit. Sherr is a masterful writer and researcher. The reader will encounter many, many “didn’t know that” facts throughout this work. The author had access to Ride’s diaries, letters and personal files to pull together this tell-all book, as well as recounting the late astronaut’s guarded personal life, specially her sexual orientation. Note: Go to a special “History in Five” video – Sally Ride, America’s First Woman in Space. Veteran ABC News and 20/20 reporter Lynn Sherr tells you five incredible things you should know about Sally Ride, America’s first woman in space. A special video now highlights the findings of a just-released report from the U.S. National Research Council (NRC): Pathways to Exploration – Rationales and Approaches for a U.S. 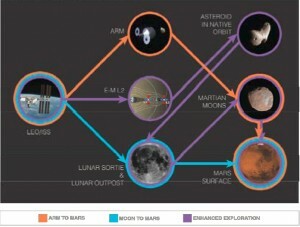 Program of Human Space Exploration. Issued June 4th, the NRC report is arguing for a continuation of America’s human space exploration program. This study concludes that the expense of human spaceflight and the dangers to the astronauts involved can be justified only by the goal of putting humans on other worlds. The report recommends that the nation pursue a disciplined “pathway” approach that encompasses executing a specific sequence of intermediate accomplishments and destinations leading to the “horizon goal” of putting humans on Mars. However, the success of this approach would require a steadfast commitment to a consensus goal, international collaboration, and a budget that increases by more than the rate of inflation. China’s military space prowess flagged in new DoD report. The U.S. Department of Defense has released its annual report to Congress on military and security developments in China. Parts of the report deal with that country’s military space and space industry capabilities. Development of a second Chinese responsive space launch vehicle dubbed the Long March 11 (LM-11). The LM-11 will provide China with “a vehicle to rapidly enter space and meet the emergency launching demand in case of disasters and contingencies,” and could be launched as early as 2014 and no later than 2016. In parallel, China is developing a multi-dimensional program to improve its capabilities to limit or prevent the use of space-based assets by adversaries during times of crisis or conflict. China launched five new remote sensing satellites in 2013, which can perform both civil and military applications. 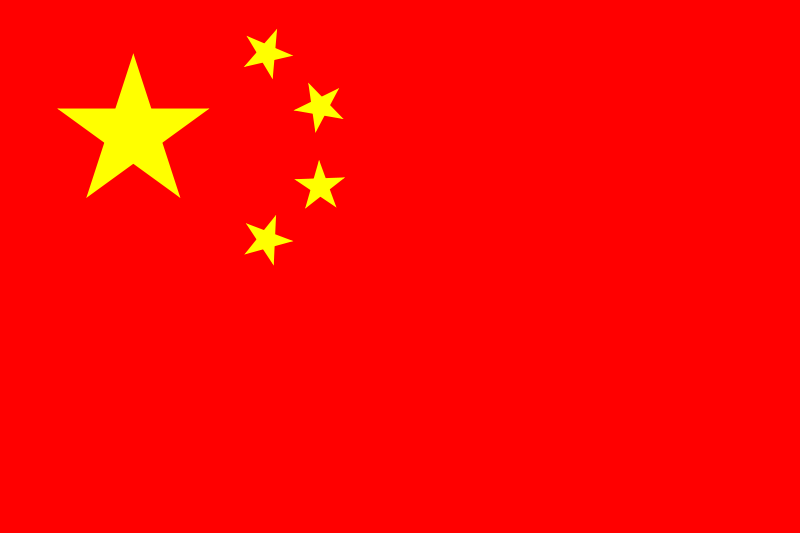 China also launched one communications satellite, four experimental small satellites, one meteorological satellite, and one manned space mission. 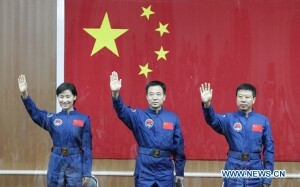 China continues to develop the Long March-5, designed for lifting heavy payloads into space. The LM-5 will more than double the size of payloads China may place into geosynchronous orbits. More than just a single heavy-lift launch vehicle, the LM-5 has propulsion technologies that are reconfigurable to produce the LM-6 light-lift- and LM-7 medium-lift launch vehicles. The new Wenchang Satellite Launch Center, designed to host these new launch vehicles, is expected to be complete in time for the first LM-7 launch in late-2014. The first LM-5 launch, delayed by recent manufacturing difficulties, is expected no sooner than 2015. 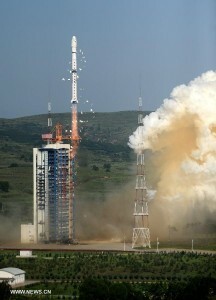 China’s space launch vehicle industry is expanding to support satellite launch services and the manned space program. The majority of China’s missile programs, including its ballistic and cruise missile systems, is comparable to other international top-tier producers, while its surface-to-air missile systems lag behind global leaders. China’s missile industry modernization efforts have positioned it well for the foreseeable future. The PLA is acquiring a range of technologies to improve China’s space and counterspace capabilities. In addition to directed energy weapons and satellite jammers, China demonstrated a direct-ascent kinetic kill capability against satellites in low Earth orbit when it destroyed the defunct Chinese FY-1C weather satellite during a test in January 2007. China plans to continue to increase its on-orbit constellation with the launch of 100 satellites through 2015. The future launches will include imaging, remote sensing, navigation, communication, and scientific satellites, as well as manned spacecraft. In a special topic section of the report, China’s reconnaissance satellites are detailed. China has developed a large constellation of imaging and remote sensing satellites. These satellites can support military objectives by providing situational awareness of foreign military force deployments, critical infrastructure, and targets of political significance. 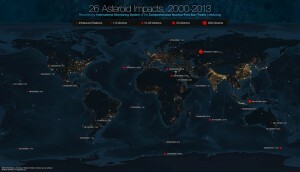 Globaïa has created a compelling infographic on asteroid impacts. The data was collected by a network of sensors that monitors Earth around the clock listening for the infrasound signature of nuclear detonations. 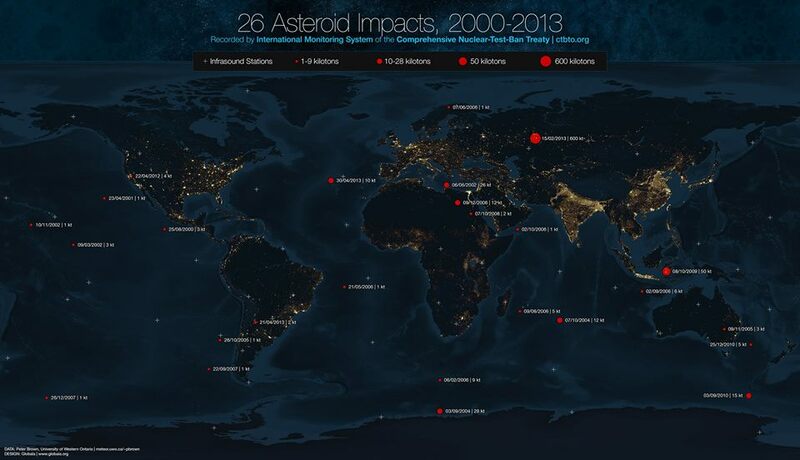 That network detected 26 explosions on Earth ranging in energy from 1-600 kilotons – all caused not by nuclear explosions, but rather by asteroid impacts. 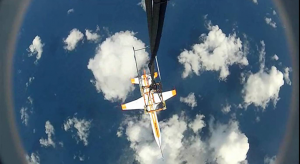 Flight test of quarter-scale SpacePlane. Last month, testing of an Airbus Defense and Space’s SpacePlane quarter-scale demonstrator showcased the conditions a full-scale craft would encounter in returning from space after suborbital missions. Airbus envisions that its business jet-sized SpacePlane – using a combination of jet engines and a rocket engine – can fly to the edge of space hauling passengers and cargo. The SpacePlane is being built to depart and land using a standard airport runway. The concept is yet one more vehicle in a growing number of craft that are vying for a projected suborbital market, such as Virgin Galactic and XCOR Aerospace. Held on May 1-4, the tests involved airlifting the demonstrator from a barge by an AS350 B3e Ecureuil helicopter operated by Airbus Helicopters Southeast Asia. At roughly 3,000 meters above ocean waters, the SpacePlane demonstrator was released. It was then piloted from the barge as it made its return to the ground, ending its flight at sea before being picked up as planned a few hours later. The quarter-scale demonstrator used in the tests was built in partnership with HOPE Technik and Airbus Group Innovations, the corporate network of research centers of Airbus Group. Airbus Defense and Space is a new division in Europe, the Airbus Group, formed by combining the business activities of Cassidian, Astrium and Airbus Military. 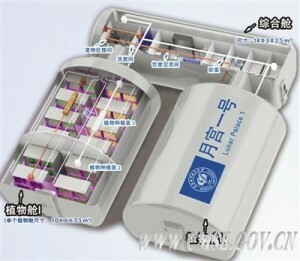 Model shows Lunar Palace 1- a ground-based artificial closed ecological facility. China has made use of its Lunar Palace 1- a ground-based artificial closed ecological facility. Last month, three volunteers stepped out of the research facility, concluding a 105-day test – the first long-duration multi-crew sealed cabin research carried out in China. “Lunar Palace 1” refers to the Integrative Experimental Facility for Permanent Astrobase Life-support Artificial Closed Ecosystem (PALACE) Research. 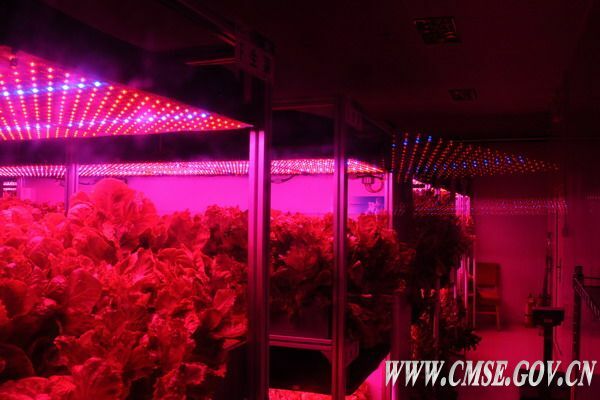 Lunar Palace 1 is a 500-cubic-meter capsule, which covers an area of 160 square meters and consists of one integrated module and two plant cultivation modules. The integrated module is divided into the living room, the work room, bathroom, waste disposal room, etc. According to Liu Hong, chief designer of the system, by applying a combination of biological technology and engineering control technology, it establishes an artificial enclosed ecological system where life basics — such as oxygen, water and food can regenerate — thus providing Earth-like ecological environment for habitants. Inside look at one area of China’s Lunar Palace 1. 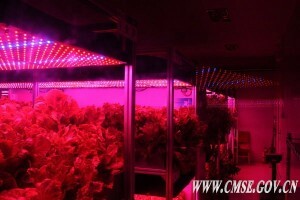 During the experiment, four kinds of edible vegetables, namely lettuce, leaf lettuce, gynura bicolor and sonchus oleraceus, were planted in a 36-square-meter area to absorb the carbon dioxide exhaled by two astronauts and provide them with oxygen and 30-50 grams of fresh vegetables per meal per person. According to the CMSE, the core of Lunar Palace 1 is the world’s most advanced closed-loop life support technology so far: Bioregenerative Life Support System (BLSS), which is essential for astronauts to live and work in space for long duration, making it possible for long-duration human spaceflight and deep space exploration. 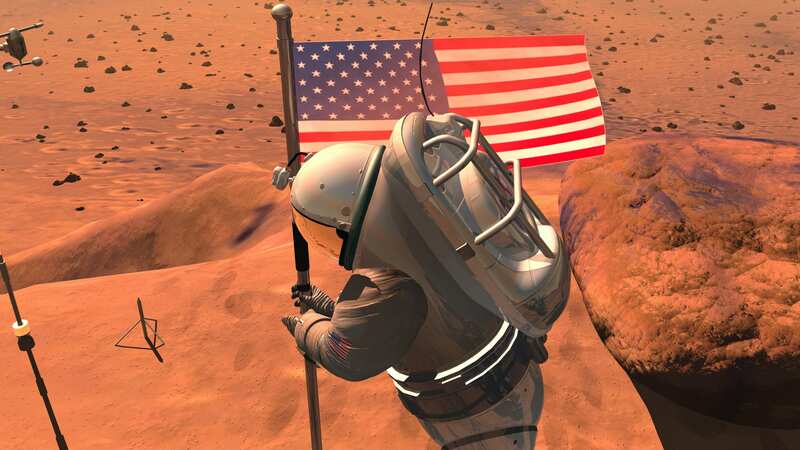 New Report Flags U.S. “Horizon Goal” – Humans to Mars! 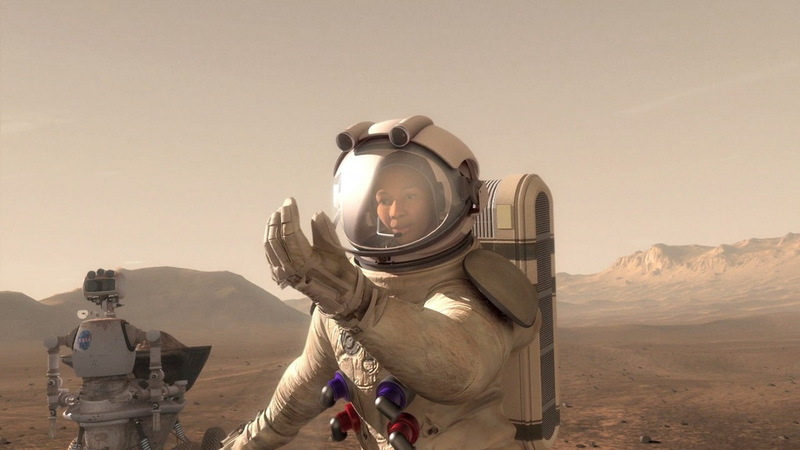 All space pathways lead to humans on Mars – according to a new report. 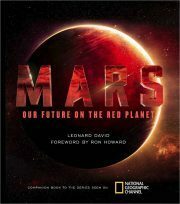 An important new report advocates that America should pursue a disciplined “pathway” approach – executing a series of intermediate steps along the way – that lead to the “horizon goal” of planting the first human footprints on Mars. “All long-range space programs, by all potential partners, for human space exploration converge on this goal,” the report explains. The congressionally mandated report from the National Research Council (NRC) was released today, titled Pathways to Exploration: Rationales and Approaches for a U.S. Program of Human Space Exploration. The study was sponsored by NASA. A 17-person NRC Committee on Human Spaceflight wrote the report. The blue-ribbon group wrestled with such issues as: Why do we go there? How to assess the technical and affordability aspects of human exploration pathways? What are public and stakeholder attitudes? NOTE: Members of the authoring committee will present the report’s findings and recommendations and respond to questions at a public briefing today beginning at 11 a.m. EDT, at the National Academy of Sciences building in Washington, D.C. While the “horizon goal” of putting humans on Mars is urged in the report, the success of this approach, the study adds, would require a steadfast commitment to a consensus goal, international collaboration, and a budget that increases by more than the rate of inflation. * How far from Earth can humans go? * What can humans discover and achieve when we get there? 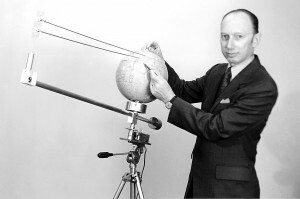 The study underscores that, over the years, rationales for human spaceflight and those sparking public interest are: economic benefits; contributions to national security; contributions to national stature and international relations; inspiration of students and citizens to further their science and engineering education; and contributions to science. Also identified in the report is a set of “aspirational rationales: the eventual survival of the human species (through off-Earth settlement) and shared human destiny and the aspiration to explore. New study evaluates different pathways to reach the planting of human footprints on Mars. The study evaluates three different pathways to illustrate the trade-offs among affordability, schedule, developmental risk, and the frequency of missions for different sequences of intermediate destinations. 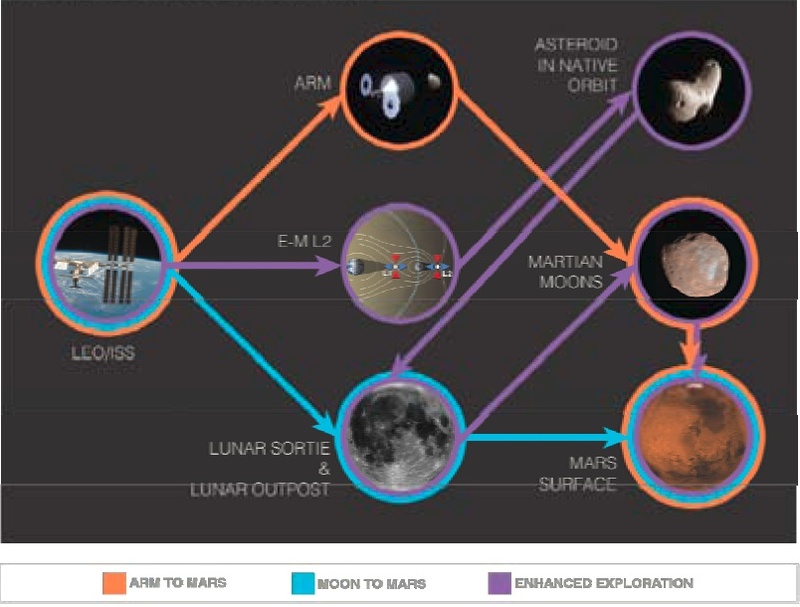 All the pathways culminate in humans landing on the surface of Mars — which is the most challenging yet technically feasible destination — and have anywhere between three and six steps that include some combination of missions to asteroids, the moon, and the moons of Mars. In one of the committee conclusions, the group noted that, given the magnitude of the technical and physiological challenges, should the nation decide to embark on a human exploration program whose horizon goal is Mars, NASA would need to begin to focus right away on the high-priority research and technology investments that would develop the capabilities required for human surface exploration of Mars. The most challenging of these will be (1) entry, descent, and landing for Mars; (2) in-space propulsion and power; and (3) radiation safety (radiation health effects and amelioration. 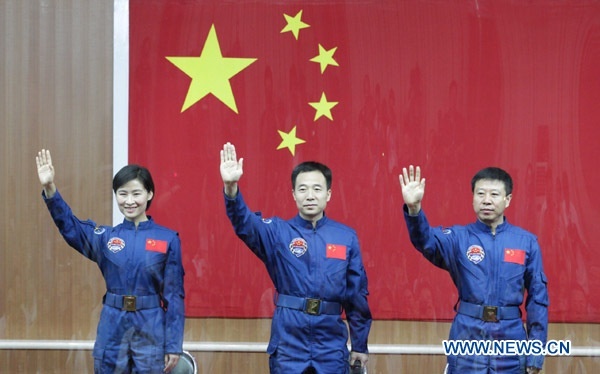 China is rapidly developing robotic and human spaceflight skills. The NRC committee identified some specific important issues that the nation will need to grapple with should it choose to embark on a renewed effort in deep space exploration involving humans. One of those issues is the prohibition on NASA speaking to Chinese space authorities, a prohibition that has left open opportunities for collaboration that are being filled by other spacefaring nations. Lockheed Martin beat out Raytheon for the new network of ground-based radars. This radar system will be sited on the Kwajelein Atoll to improve the ability to identify and track objects in space. Construction of the new Space Fence system on Kwajalein Atoll in the Marshall Islands is slated to begin in the fall of 2014 to meet the program’s 2018 initial operational capability goal. The system’s design incorporates a scalable, solid-state S-band radar with a higher wavelength frequency capable of detecting much smaller objects than the Air Force’s current system. This improves accuracy, quickens response time and expands surveillance coverage. Utilizing this powerful, new ground-based radar, Space Fence will enhance the way the U.S. detects, tracks, measures and catalogs orbiting objects and space debris with improved accuracy, better timeliness and increased surveillance coverage. There is much to do given the on-going and growing orbital debris problem: Debris from space collisions, tossed away rocket stages, dead or dying spacecraft. Fast-moving “space junk” orbiting the Earth can be lethal to spacecraft and satellites in their path. Lockheed Martin will deliver up to two advanced S-band phased array radars for the Space Fence program. 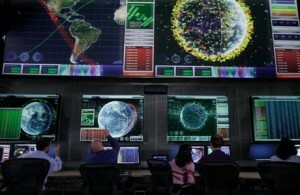 The Space Fence radar system will greatly improve Space Situational Awareness of the existing Space Surveillance Network. 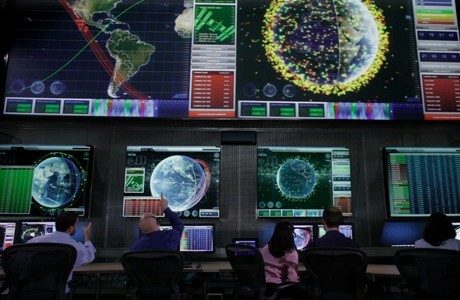 Critical services are being threatened by space clutter that circles Earth, said Dale Bennett, executive vice president of Lockheed Martin’s Mission Systems and Training business. “Space Fence will locate and track these objects with more precision than ever before to help the Air Force transform space situational awareness from being reactive to predictive,” Bennett said in a press statement. 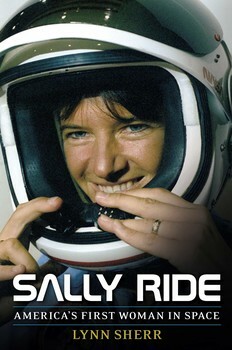 Sally Ride, America’s First Woman in Space, is a new book written by veteran ABC News and 20/20 reporter Lynn Sherr. Published by Simon & Schuster, this 400-page book is available starting this month. Sherr has written this definitive and fascinating biography of Sally Ride, with exclusive insights from Ride’s family and partner. Sally Ride made history as the first American woman in space. A member of the first astronaut class to include women, she broke through a quarter-century of white male fighter jocks when NASA chose her for the seventh shuttle mission, cracking the celestial ceiling and inspiring several generations of women. After a second flight, Ride served on the panels investigating the Challenger explosion and the Columbia disintegration that killed all aboard. In both instances she faulted NASA’s rush to meet mission deadlines and its organizational failures. She cofounded a company promoting science and education for children, especially girls.